I am a collector of magazines. Have been ever since my Sassy years but now I lean towards the crafty bits and of course Parenting mags. I myself am not a parent, not yet anyway but I am an educator and I love love love watching children in their development. It is such an exciting thing to behold. Truly magical. One thing that irks me about parenting magazines is the articles. I love a nifty party idea and of course the pages and pages of too cute clothes and toys but the articles tend to be "professionals" talking down to parents or maybe that's just me. I just get the feeling that they are a wee bit preachy. Wondertime doesn't do that. At least not in a big way. What I like about Wondertime is that is comes from a developmental point of view. I have a strong belief that people who plan on being parents should take at least one course in Child Development. It would be immensely helpful for both you and your children. Sure the magazine is produced and distributed by a huge conglomerate and it is chock full of clever ads but the articles themselves embrace the spectrum of parenting and parenting issues. It also works as a great companion for caregivers. I do not work for nor have I ever worked for any company involved in the publication of wondertime, just so ya know. I simply like this magazine and I want to recommend it to you all. Oh, and the website is pretty nifty also. This month's issue is full of fun albeit for those of us with sunnier climates. For you Dad's out there, the current issue has oodles of articles written from your perspectives. Previous issues have included articles on the merits of technology AND nature, growing a children's garden and how to play with your kids as they grow older. Guest contributors have included Dr. T. Brazelton and Daniel Pinkwater. The presentation of the magazine is a little Martha Stweart and a little Dwell. It is pleasing to the eye with neutral colors and nifty photography. Even though is is published by Disney, you won't find any technicolor princess stories in their book recommendation pages. I guess you could say this is a fancier hardcopy form of FamilyFun. Well, that's it for today. I hope you found this helpful and if you pick up a copy of the magzine let me know what you think through gmail...scrumdillydo. Thanks! Let's make some tarts! 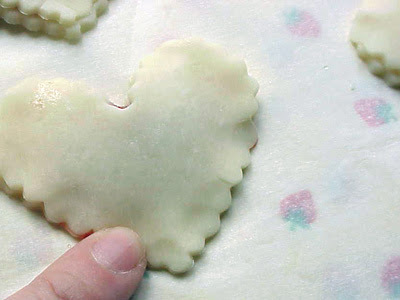 Making jam tarts is fun and super easy especially if you use premade pie crust. It can be homemade or store bought. Just know that the store bought stuff can be salty and full of all that extra stuff but if it is a once in a long while thing then go for it and don't worry! 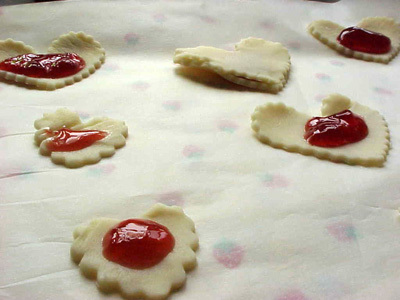 Roll or unfold the dough so that your kidlets can go to town on it. 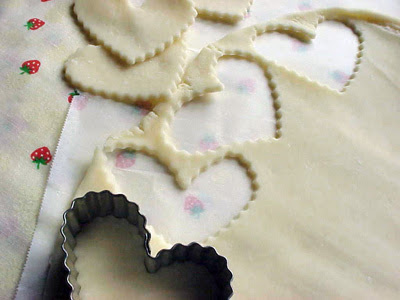 Have your wee ones use cookie cutters to cut out their tart shapes. 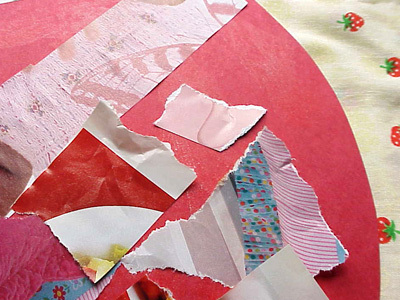 You can also use the knives or pizza wheel to cut out rectangular pieces that can be folded in half. 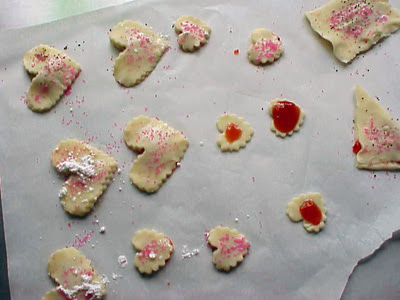 After all the shapes are cut out, space them onto the parchment paper and place onto the cookie sheet. Preheat oven to 400 degrees. Using the smallest spoon ya got, a baby spoon would be great, have your kidlets drop a spoonful of jam onto the center of half the cutouts. Next up, gently place a cutout on top of each jam dotted shape. Push down a wee bit onto the edges to seal. 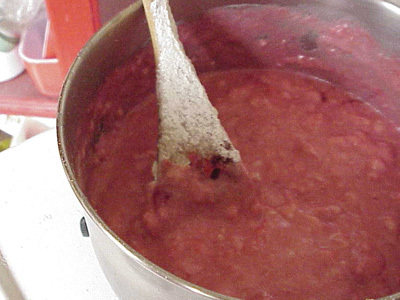 The jam will bubble up and seep out when baking which is why you want to use as little as possible. It's totally okay to use more and have it seep, no worries! You don't have to add a top to every shape either but the tops give your wee ones an opportunity to decorate! 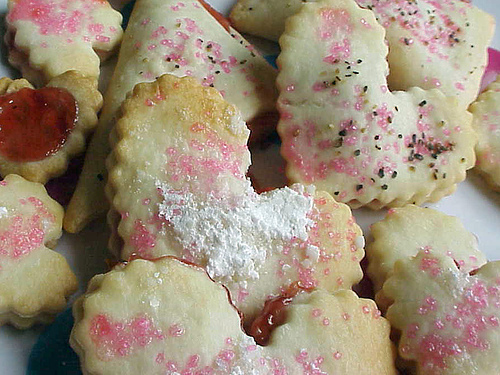 Have your kidlet(s) "paint" each covered tart with a little bit of milk. This will help the sugar stick to the dough. Then let them go to town with their colored sugar and/or sprinkles. Once done, pop into the oven for 10 minutes or until bubbly and lightly browned. Cool and serve with pink milk or some caffeine free tea! Yay! Have a berry delicious day! This is a great activity for anytime. You can do the leg work yourself or hand your kidlet a pair of scissors and a stack of magazines and let them go to town. I used to do this when I was 5. Yay! Allowing your kidlets to scavenger their berry pages helps with color recognition and of course building that good ol' self-esteem. Besides, maybe your kidlet doesn't want to make a strawberry, maybe they want to make a blueberry or perhaps a nanoberry. The hunt though can be a lot of fun and can also give you a few extra minutes to throw in that load of laundry, write a quick blog entry or grab your golf clubs from the garage. You can also do the scavenger hunt with letters, animals and shapes. Just make sure your kidlet is scissor ready and/or the scissors they are using are child safe. If you are able to go through and dismantle a magazine your self you can cram all the bits into a storage container or resealable bag and have your wee ones color sort into cute bowls or onto squares of colored paper. Having a couple of bags or containers on hand can be a lifesaver for when you need those extra minutes especially when you name them something spiffy like "Bea's Magic Rainbow" or "Simon's Secret Color Stash" You get my drift, and always, have fun! Set out your supplies. If your kidlets are younger, have your scarps ready for them. 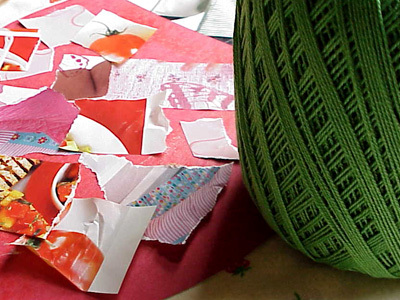 I went throguh 2 magazines and tore out pages with red and pink colors and then cut them into strips and squares. I also did a page of green for the top of the berry. 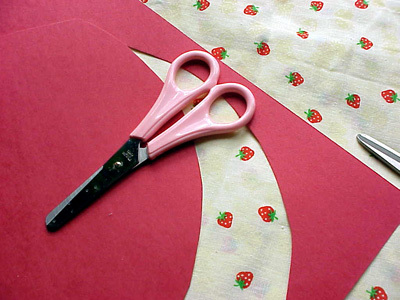 Draw a strawberry shape onto the cardstock and cut out. 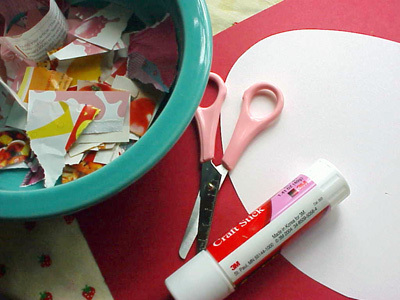 Glue red construction paper to the top and trim if you want to use a colored base. 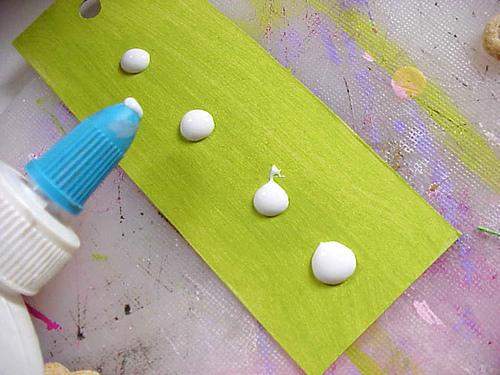 Let your wee ones go hog wild with the glue stick, covering the entire surface with adhesive. Now they can add all the scraps they want. You can also give them ribbon, tissue, beads, glitter, feathers, etc. 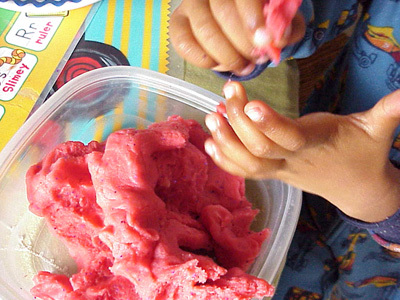 Cooking with kids is a great time to introduce them to math and science concepts! When following a recipe your wee ones will also learn sequencing and ordering and the end project is extra spiffy, don't ya think? For kidlets that aren't reading yet, you can write out "recipe cards" onto large sized index cards or regular old paper. You may want to laminate the cards for repeat usage. Using numbers, symbols and pictures will help get your wee ones started. They aren't reading exactly but they are prereading which is a good start. Keep the recipes simple and initiate a cooking day, your wee ones will surely come back for more! As their literacy skills strengthen, start switching out symbols for words. If they have prepared the recipe enough times they will have remembered the steps. Seeing and "reading" the words will boost their autonomy which builds self-esteem and they will be reading for real before you know it. In honor of Strawberry Day I give thee a photo recipe for smoothie making with your kidlets. I however did not make a picture filled recipe card but the pictures I took are quite happy, have fun! You can use any combo of the above you like. If you don't want to use bananas, use more yogurt and using the frozen fruit chills your smoothie so you don't need to add ice. You can use flavored yogurt but you already have enough sugar from the juice. sturdy plastic knives are perfect for cutting and chopping fruit like melon, bananas and apples. Kidlets won't cut themselves and the process assists with fine motor skills and problem solving. Set out your juice in a small plastic carafe along with a 1-2 cup liquid measuring cup (I am sorry I am so poor at converting to liters). Have your kidlet measure out the juice themselves, teach them how to read the cup so that they can do this with finesse! They will be so proud! Next, have them poor the measured juice into the blender top. Now it is time to add your fruit. Top it with a dollop or two of yogurt, place lid on blender and allow your wee one to blend away unless of course the noise freaks them out! Now, you can pour the smoothie back into the carafe and let your kidlets pour the drink themselves or you can do it for them. This recipe should make about three small juice cup sized servings. 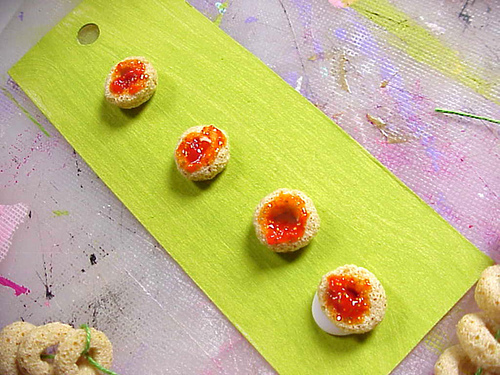 Garnish with a paper parasol, strawberry, sprig o' something green and a dash of nutmeg, cinnamon, black pepper or colored sugar and you're ready for a tastey break. Have fun and expirement! If you do make any of the posted scrumdilly-do creations, we would love to see them in the scrumdilly-did! flickr pool! Have an idea you wanna share? Email me and you could be featured on scrumdilly-do! 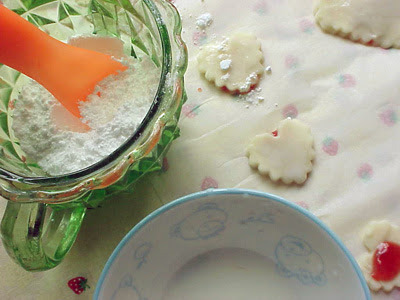 Homemade playdough is ridiculously easy to make and if you have cream of tartar on hand it will keep for up to six weeks! Add all ingredients to your pan and mix over medium heat. Remove from heat once mixture forms a ball in the center of the pan. 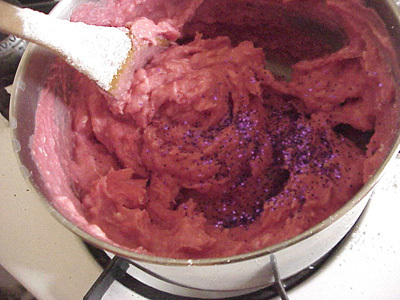 If you like, add a bit o' glitter and stir. 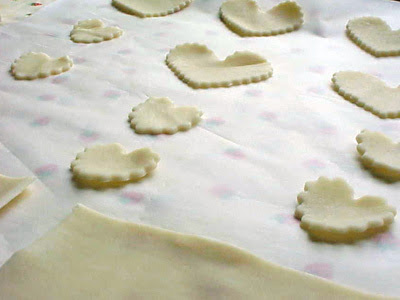 Dump your blob of dough onto a cutting board or cookie sheet to cool. Once cool, hand it over to yer kidlets and let them play! Keep dough in a sealed container or zip bag for up to six weeks. No need to refrigerate. 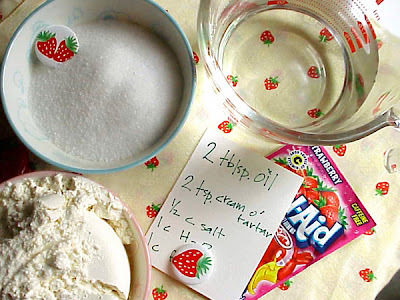 If you don't have any cream of tartar, keep sealed in the refrigerator for a week. Salt dough recipe from Maryanne Kohl's nifty book titled Mudworks, I highly recommend it! It's available in Spanish also! In celebration of Strawberry Day and the upcoming season for those of us in sunnier climates I give you a few ideas regarding this wee bit of red sweetness! What is Little Mouse to do? He has scored a most awesome red, ripe straberry but the BIG Hungry Bear wants it also! The Little Mouse moves the strawberry from hiding place to hiding place until he can't stand it! How does the story end? 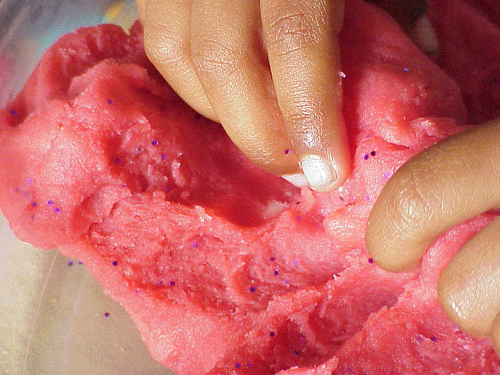 Check back tomorrow for some strawbery playdough fun! Please forgive that big ugly gap at the top. I have no idea how to fix it but thought maybe a visual of the kaboodle list would entice ya to take a looksie. There are all sorts of links to great books and other fun, games and toys! How are you gonna celebrate pizza day? Ready, Sit, Read: backpack, originally uploaded by jek in the box. Howdy folks! A short while back I posted about this nifty backpack full of fun that I received from Target's Ready! Sit! Read! bookclub. Ooodle of you flocked to the site to sign up but found no information on how to receive such n iftiness...never fear, the mystery may have been solved! Gena from Monkeyporkbun signed up for a club not long after my post and then forgot to get all hopefull about the kit. Lo and behold it arrived on her doorstep earlier this month! Thank you Gena for the heads up, I hope everyone has a nifty book filled year! 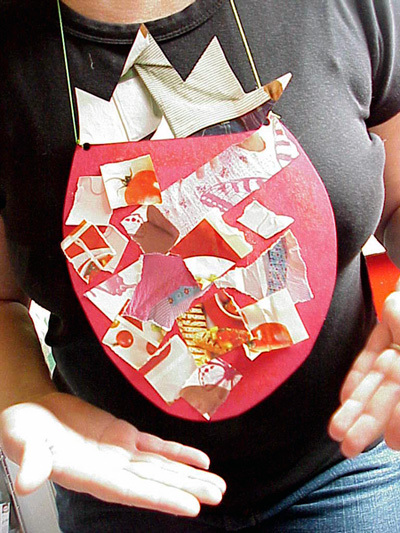 Cut out your pendant shape from the cardboard and cover with paper using a gluestick or paint it using your paint. 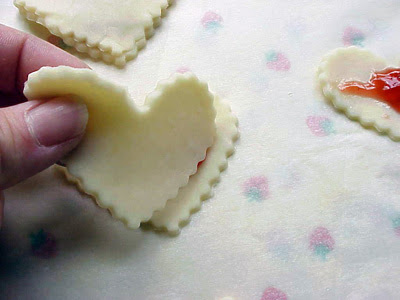 Once dry, glue on your pasta or cereal, punch a hole near the top and set aside to dry. 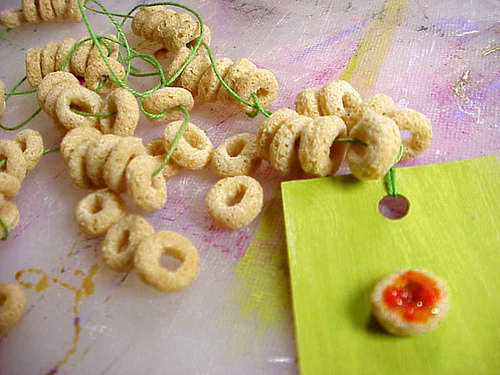 Cut thread to desired length and thread a piece of cereal or pasta onto it about three inched from the end. Tie a knot so that the piece is anchored. This keeps the other pieces from falling off. Have your we one thread to their hearts content about half way in any pattern they like. Add your pendant piece looping a knot on the top after threading. This will keep it from flipping backwards and sideways. Have your wee one continue thread until about three inches from the end, tie ends together and viola! A beautimous necklace made just for Mom! Don't let my list limit you! 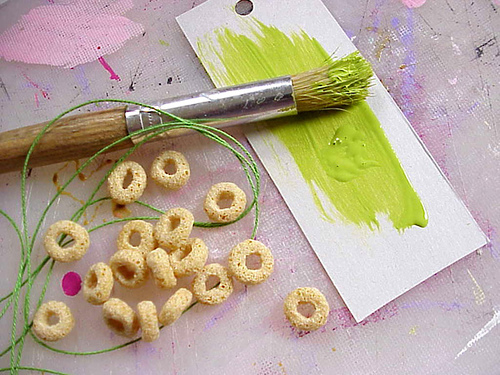 You can mix it up and use pasta AND cereal AND beads if you have them. Looping the thread through each piece twice will keep it anchored in one spot creating a gap between other pieces. You can even paint the pieces once you're done! >NALC food drive which is the largest one day food drive in the world! AMAZING! To help, all you have to do is Place your food items in bag on your doorstep before your mail carrier arrives and she or he will do the rest you can also bring the food directly to the Post Office where Postal Clerks will be sorting all the goods to donate to your local food banks. For more information check out the Stamp Out Hunger site. The book shown above is a delightful story of how one act of kindness can grow and grow and grow. 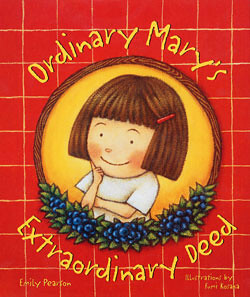 Ordinary Mary's Extraodrinary Deed was written by Emily Pearson and Illustrated by Fumi Kosaka. It was published by Gibbs-Smith. Read more about Ordinary Mary here. Read your wee ones this lovely book before heading out to your local firehouse! Tomorrow is also Fire Service Recognition Day in Los Angeles and all of our firehouses will be open for you to drop on by and visit between 10am and 4pm. This would be a perfect time for you to bring thanks and cupcakes for all their hard work. Just this week more than 500 firefighters battled the Griffith Park Fire that burned over 800 acres and threatenned numerous homes. There will bea free pancake breakfast starting at 8:30 at Old Station 17 which is also home to the LAFD Museum. Old Station 17 also houses a fire service research library and a learning center for kids and adults. Check out the LAFD blog for more info. The Little Fire Engine was written & illustrated by Lois Lenski. It is published by Random House. fcwf, originally uploaded by Sew Darn Jenny. 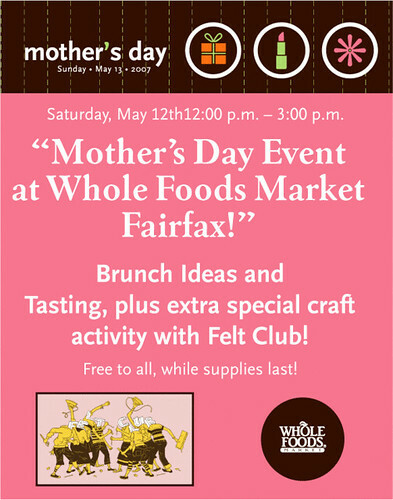 If you're in the L.A. area and want to get some shopping done while yer wee ones create beautifous macaroni creations for you, come on by! You'll get to meet me and the fabulous ladfy behind Felt Club, Jenny! So....swing on by, it will be fun! I was bit by the book shopping buzz ealrier today and decided that I couldn;t afford all the chicken books on my list so I hopped on over to Book closeouts and found a few of my all time faves priced ever so niftily! I ordered multiples! First Up...The Rocko & Spanky books. I adore the LaReau sisters and want to be their best friend. Lookie the fabulous illustrations AND these books include crafty how to projects in the back! Get them both! Hurry! Next up is Goldilocks Has Chicken Pox illustrated by one of my all time faves Hanako Wakiyama..you must check out this super sweet take on a few of our favorite caracters. The illustrations just scream vintage. So what are ya wating for? Pick up these and maybe a few more! Hurry! Do you all know the story of Chicken Little? 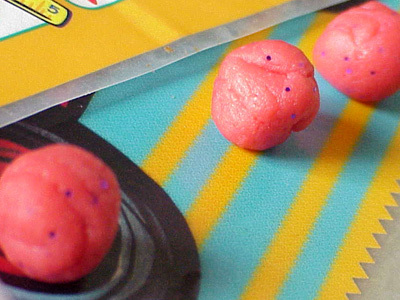 Do you remember it from your childhood? How did it end? Have you told it to your kids yet? How does that version end? Yesterday I did a presentation for my Children's Literature class on folktales and fables about chickens. I went to my library and checked out over twenty books, four of which were Chicken Little. I was surprised to find that they have changed the ending and I sort of understand the logic but really what I think is they are ruining the message of the story. What message can be found if all the animals laugh off their idiocy? One person told me that having the animals get eaten was too violent. Too violent? Wait a minute, are those spiderman toys peeking out of your bag? Is that your four year old playing Star Wars? Yes, the animals get eaten but they are eaten as a result of their foolishness. They blindly follow a frantic chick who thinks the sky is falling. Did any of them look up to see for themselves? Of course we want to protect our children and shield them from violence but look around folks. Billboards, commercials, conversations overheard in public...mainstream music even is full of violence, bad attitudes, neglect, hatred and sexuality. Fables of old served a purpose to bring forth a message or question of morals. Young children do know how to seperate some fantasy from reaity and they are intelligent enough to get the message. Just ask them some time. Only you know when your child is ready for such tales and only you know if they are capable of processing the fantasy of our more mainstream modern day stories. Take them to see Star Wars if you must but wouldn;t you rather read them a classic? Wouldn't you rather discuss with your kidlets their feelings on the story and wouldn't it be fun to create because of the story? When given the opportunity, our children can be quite creative. This flannel board set I made for my presentation doesn't have to be used only for Chicken Little and it doesn't have to be used only by you. It is super easy to make and you can add other characters as you go. My board was made by covering apart of a recycled box with flannet that is pulled and stretched over the front and tacked to the back with thumbtacks. You can made a stand for the back or simply lean it against the wall or even mount it ot the wall in a place where your wee ones can reach it easily. My animals were made from felt which sticks easily to the flannel. The features were ironed on using fusible webbing but you can get fancier of course! If yer not so crafty, Find images from coloring books and such and trace or copy them onto cardstock. 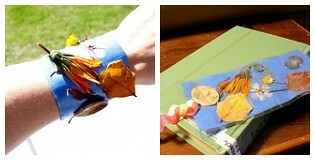 Back the paper with felt or flannel or add a small dot of scratchy velcro and they too will stick to the flannel. A flannel board can be used to tell favorite stories or your wee ones can use it to make up and act out their own stories and games. Dramatic play is a crucial element to any young child's development and using this device is a perfect way to have dramatic play everyday. If your wee ones are quite wee, cut out a bunch of shapes for him or her to play with. The lesson of cause and effect will gently be absorbed as she feels her way through the materials. For even younger wee ones, a plastic mirror can be backed with velcro and placed at the bottom. This is perfect for your wee one to delight in his or her image and keep them entertained for a short while. Flannel is fun and there are so many ways you can utilize this tool, how are you going to do it? fiesta2, originally uploaded by khushdude. Check out khushdude's flickr page for more amazing photos! May 3 is Space Day. Since I have a thing for Robots I thought I would get y'all amped up to throw a robot party like this amazing mom did! Birthday parties can easily get out of hand, especially if you live in a neighborhood where bigger is better. All you have to do is take a deep breath and let your wee one help in the planning. Bouncey house or not, you will have an excellent day full of fun and a wee bit o' chaos! For a space or robot themed event there isn't much you can't do. All you really need is an awesome art activity, a couple of games, cake and a take home item. If you serve up cupcakes with a sprinkles bar that is even better! The birthday boy pictured above had a blast. There was robot making from recyclables, pin the nose on the robot and much running around. Plus, there was cake. For the giveaway/goodie bag, Mom Stacey ordered up a couple of custom t-shirts at a great deal from custom t-shirts. You could do this with an image drawn by your kidlet. You don't have to go all out, just pick a theme and run with it. Keeping the festivities outdoors is best. Kids need a lot of space as their energy levels grow in leaps and bounds as the group grows. I'll try to get a kaboolde list togethre for you later today. Have fun! There is nothing I like more than seeing a scrumdilly-do project as done by someone other than myself! Thank you to Jennifer for taking on a couple of kidlets and for attempting a bunch of projects. This bracelet is hers as the wee ones probably destroyed their own. You can do this anytime, anywhere as long as you have some masking tape handy. Keep a roll in your car and occupy your kidlets on quick errands and the like. 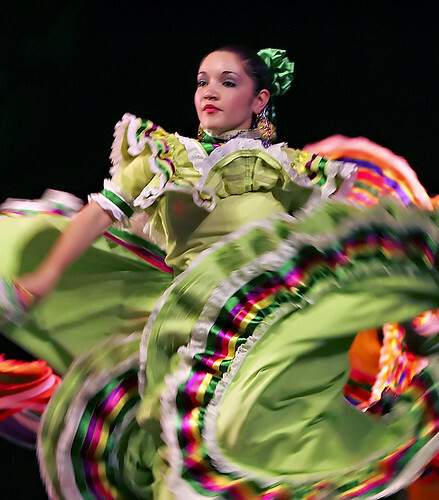 Coming up wee piñatas for one!